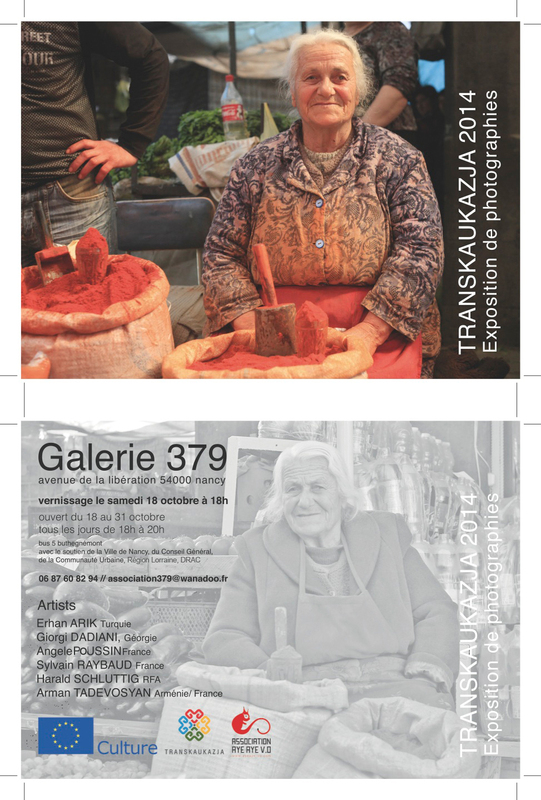 This exhibition represents the apex within the multimedia project that was born in Nancy in September 2014, supported by its organizer Arman Tadevosyan and by the association Aye Aye VO. Several events took place during the International Film Festival of Nancy Lorraine: the programming of movies from the Caucasus, the concert of the Tatvamasi group, the exhibition of photos of Eastreet 2, the KD Gallery, and the residence of the artist filmmakers (Armenians, Poles and French), who for months have documented immigrants from the Caucasus and their integration in the region of Nancy …. The movies are, which will show the fate of Caucasians immigrants , are eagerly awaited. Gallery 379 hosts for two weeks’ the viewpoints of the photographers. Three of them are natives or inhabitants of the region, while the other three are travelers. Harald Schluttig with his portraits, two years later in the same market of “spice market in Gyumri, Armenia”. Angela Chick with her portraits Triptych “gyumretsi” (people of Gyumri) during her trip to Armenia in 2009. Giorgi Dadiani, with the series of photographs of the “08:08:08”, following the war in Georgia against Russia in 2008. Sylvain Raybaud, who in 2013 made a trip of several months to Armenia, passing by other countries such as Turkey and Georgia. Erhan Arik, with photos showing the two sides of the Turkish-Armenian border. Arman Tadevosyan with six landscapes of his hometown Gyumri, Armenia. Nancy, October 18th October 2014, Emmanuelle Costet.